Prayers for Bedtime and Every Time of Day! Parents can do so many things for their children. We can tie their shoes so they don't trip and fall. We can make sure they have warm clothes and full tummies. We can even help them tackle some of the mysteries of higher math. But the most important thing we can do is teach them to pray. Childhood is the best window for learning prayer. We can teach them to talk to God about everything, anything, anytime, and all the time. We can't promise an easy life, but we can equip them to face life. We can't be with them always, but God can. 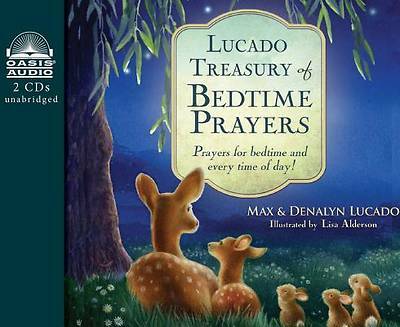 Written for playtime and bedtime, happy times and fearful times, and all times in between, the Lucado Treasury of Bedtime Prayers is a wonderful collection of classicchildren's prayers and new prayers by best-selling author Max Lucado and his wife, Denalyn. These prayers will help your child see that God is always there for them, ready to listen, guide, comfort, and love. Because you can't stop every scrape, heal every broken heart, or banish every bully, but you can teach your child to pray.